Are these symptoms sounding familiar? 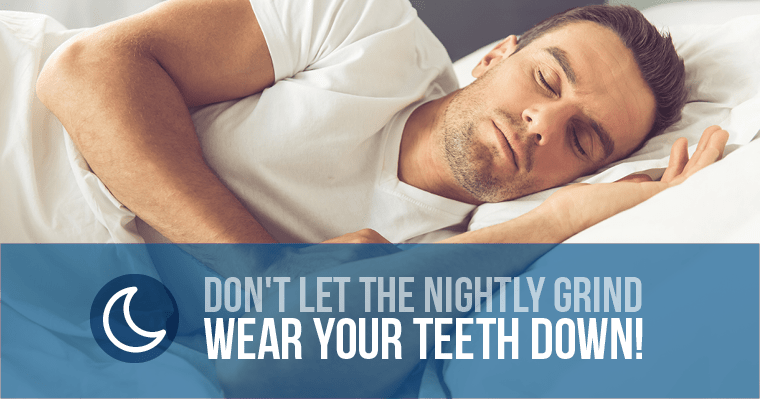 You may be grinding your teeth at night, known as bruxism, and you may not even realize it! This is a fairly common disorder, and there are solutions to relieve your headaches and other symptoms. While customized nightguards cannot stop teeth grinding, they can protect your teeth from the nightly grind. Why see your dentist for a nightguard? Unlike over-the-counter guards, nightguards are custom-made by your dentist of high-quality materials and fit snuggly around your smile for comfort. Are your teeth out of alignment? Do you wish you had a straighter smile? You can have a beautiful smile AND possibly stop bruxism by seeing your dentist about cosmetic and restorative dentistry. Bruxism is often a sign your bite and teeth are out of alignment, and correcting it may help. Did we mention you will also gain a beautifully improved smile? You can think of it as killing two birds with one stone, walking out of our office out of pain AND with a new smile. If you’re seeing the signs of teeth grinding (including chronic headaches or migraines), contact our dental office to get you in for a nightguard consultation 316-722-8148. It could be the solution to a great night’s sleep – free from pain!